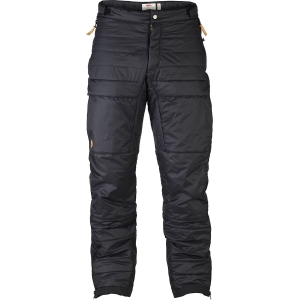 Visit Patagonia's Insulated Snowshot Pants page. 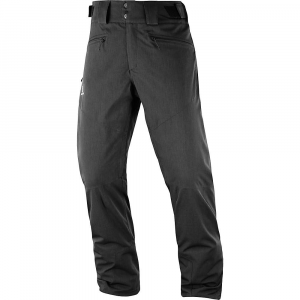 Patagonia's most flexible pants for going off kickers and sticking whatever comes next, the Men's Insulated Snowshot Pants have a waterproof/breathable H2No barrier to keep you rolling in sub-optimal weather. The durable 2-layer, 150-denier 100% polyester shell has our Deluge DWR (durable water repellent) finish for storm protection. Waist details include a soft, brushed-tricot lining with an internal adjustment for just the right fit. A brushed, 100% polyester mesh liner in the seat and thighs adds insulation and wicking power while slick mesh lines the lower legs for nonstop glide. 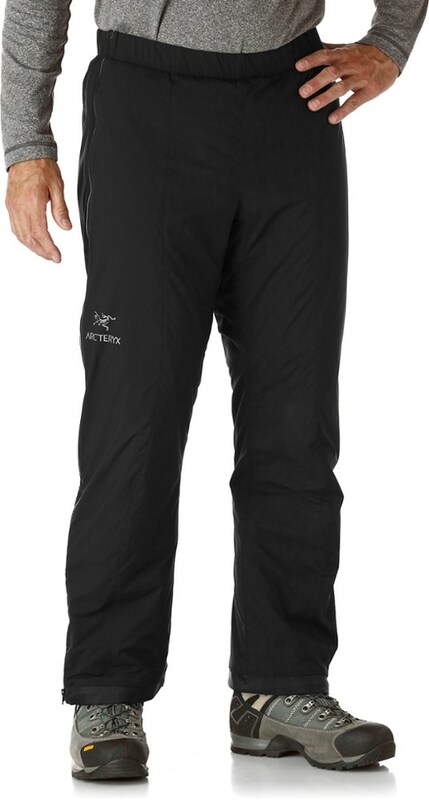 The articulated legs have interior mesh-lined thigh vents to help you keep your cool. Loops on the rear yoke seam connect to the powder skirt on all Patagonia Ski/Snowboard jackets. Pockets: two in front, two in back and one easy-access thigh pocket (w/ integrated pass holder). Short inseam length (size M) is 30 1/2". 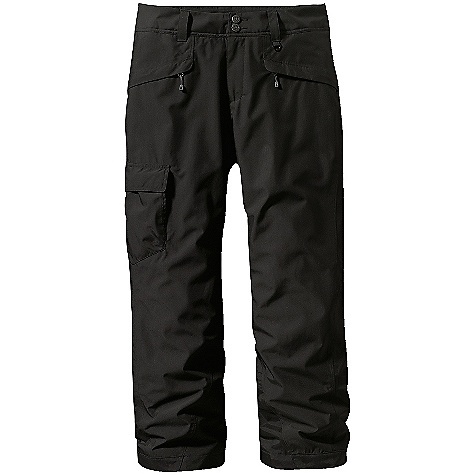 The Snowshot Pants are recyclable through the Common Threads Recycling Program. 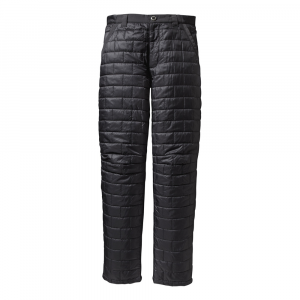 A friend to the dynamics of halfpipes and wind lips, these supple pants keep the heat turned up with a compressible layer of stay-warm-when-wet Thermogreen(R) insulation. An internal lining, made of soft taffeta for wickability and a smooth glide, keeps it in place. The durable shell is made from a 2-layer, 150-denier 100% polyester fabric with a waterproof/breathable H2No(R) barrier and a Deluge(R) DWR (durable water repellent) finish for bomber storm performance. Thigh vents act like thermostats to control your inner temperature; they're mesh-lined to keep snow out. The cuffs have burly scuff guards and internal gaiters. Soft, brushed tricot lines the internally adjustable waist that has loops on the rear yoke seam (that connect to the powder skirt on all Patagonia(R) Ski/Snowboard jackets). Two pockets in front, two in back and one on the thigh (with an integrated pass holder) hold the little things in life. On Sale. Free Shipping. Patagonia Men's Insulated Snowshot Pants DECENT FEATURES of the Patagonia Men's Insulated Snowshot Pants Durable 2-layer polyester has a waterproof/breathable H2No barrier, and Deluge DWR (durable water repellent) finish for storm protection; 60-g Thermogreen insulation ensures you stay warm Waist details: Soft brushed tricot lining wicks moisture; adjustable elastic tabs customize the fit; two-button closure and zip fly Loops on rear yoke securely attach pant to powder skirt on any Patagonia Ski/Snowboard Jacket to keep snow out Mesh-lined interior thigh vents release heat and keep snow out; articulated knees improve mobility Gaiters keep the snow out, while tough scuff guards protect inside of leg and bottom hem Pockets: Two secure zippered handwarmers, two rear and one right thigh that secure with hook and loop Relaxed fit The SPECS Weight: 36.5 oz / 1035 g Fabric: Shell: 2-layer, 5.6-oz 150-denier 100% polyester with a waterproof, breathable H2No barrier and a Deluge DWR (durable water repellent) finish Lining: 2-oz 100% polyester plain weave Insulation: 60-g Thermogreen 100% polyester (90% recycled) This product can only be shipped within the United States. Please don't hate us. 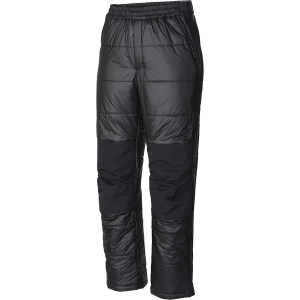 The Patagonia Men's Insulated Snowshot Pants is not available from the stores we monitor. It was last seen October 30, 2013	at Second Ascent.